Updates have been thin on the ground here for the last few days. After a long anxious wait on Friday, I’m glad to say I do still have a job which should have left me with plenty of time for blogging but this seems to have worked the other way around. 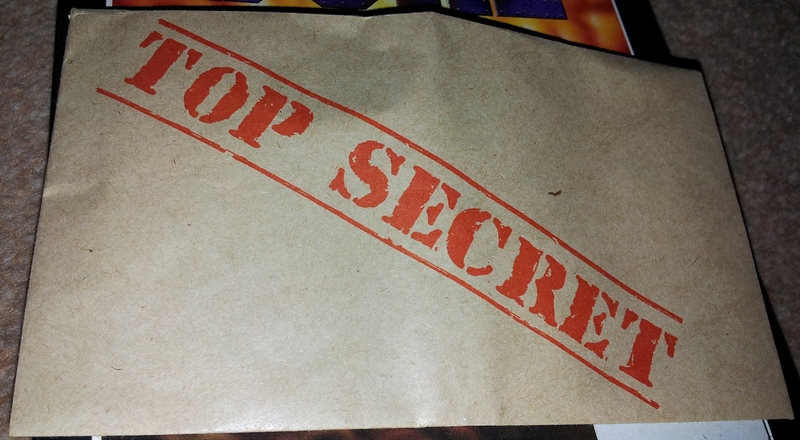 10 months of being under threat of redundancy tends to put your life on hold and I have a stack of things to sort out having come safely through the other side. One of the easier tasks on the list was sorting out a new mobile phone contract. A new phone should mean I can get some half decent photo’s from here on out. So by way of a trial run, I thought I would find something Origin related and photogenic. The first thing that sprung to mind were trinkets. 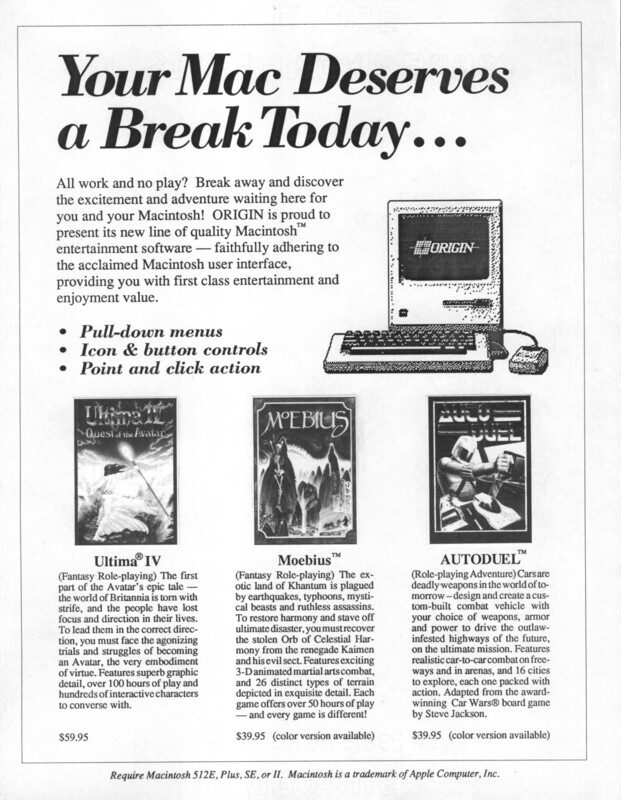 Origin were famous for including trinkets with their games in the mid 80’s. 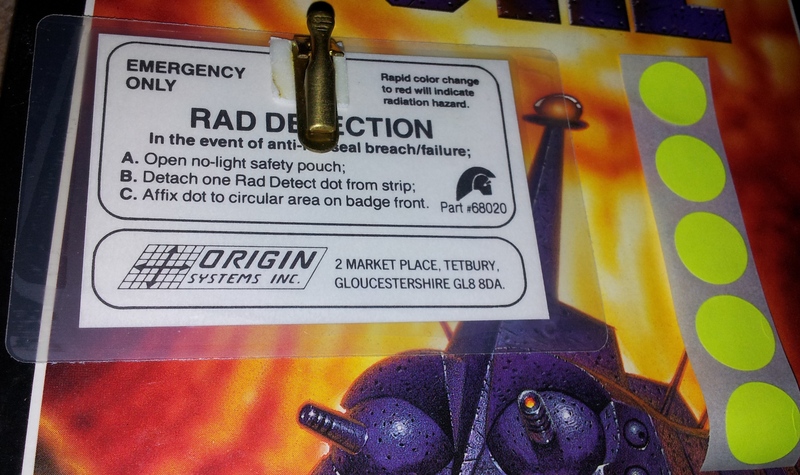 These were basically useless little items put in the box for gimmick/novelty value or to add some extra atmosphere. 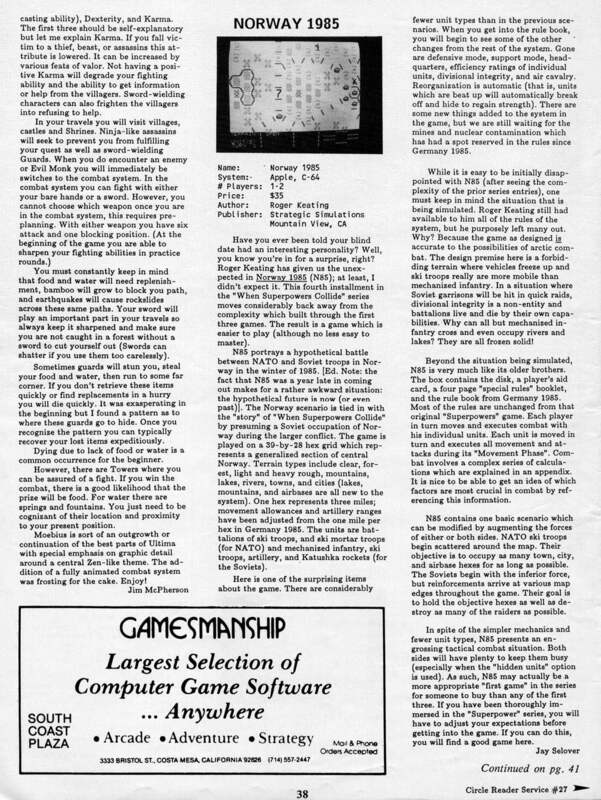 They weren’t unique in this with Infocom also being a prime exponent. Combined with the wealth of documentation, cloth maps, etc, it made buying any of these games quite a different experience in my eyes. The practice is still kept alive through special editions at least, but this usually comes with a serious price tag. 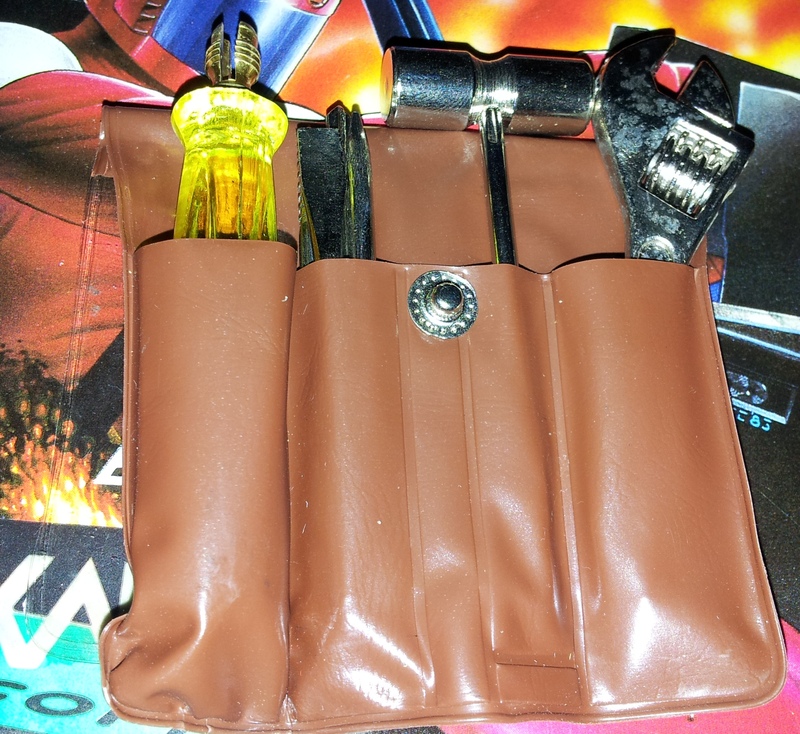 In what is potentially one of the most useful trinkets ever included in a game, Autoduel came with a toolkit with a screwdriver with 4 different ends, an adjustable spanner and a miniature hammer all in a little plastic pouch. This is definitely one of my favourites even if it does look like something you might find in an expensive Christmas cracker. 2400 AD came with not one but three little lead figures. These any tiny and proved the greatest challenge for my new camera. 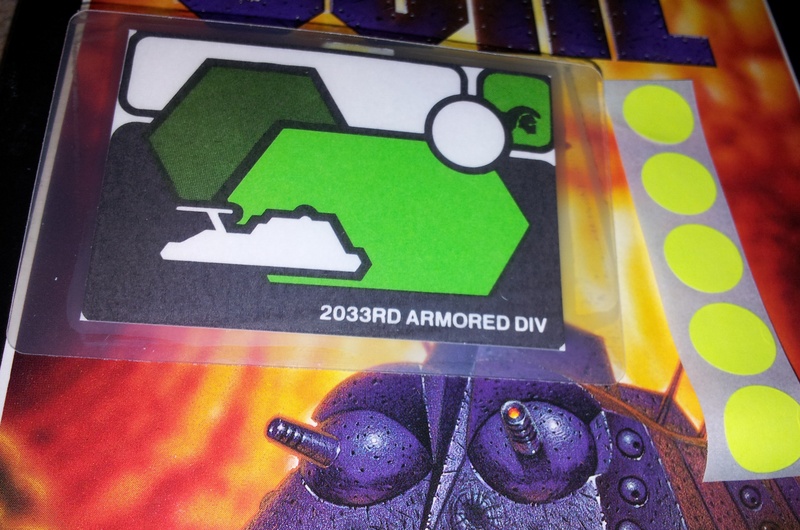 Included with Ogre was a radiation badge and stickers (in a top secret envelope). The principle behind these is that you stick a dot to the badge, walk around a dangerous area with it in view and if it changes colour you know you have taken a certain dose of radiation and need to get out of there. I’ve heard rumours that the dots included with this are the real deal but I don’t expect I’ll ever get the opportunity to try them out. Last but not least is Moebius which came with a nifty bandanna if you fancied dressing the part while playing the game. This is one step behind another game I have on my shelves (Life And Death) which came with a surgeon’s mask and rubber gloves. 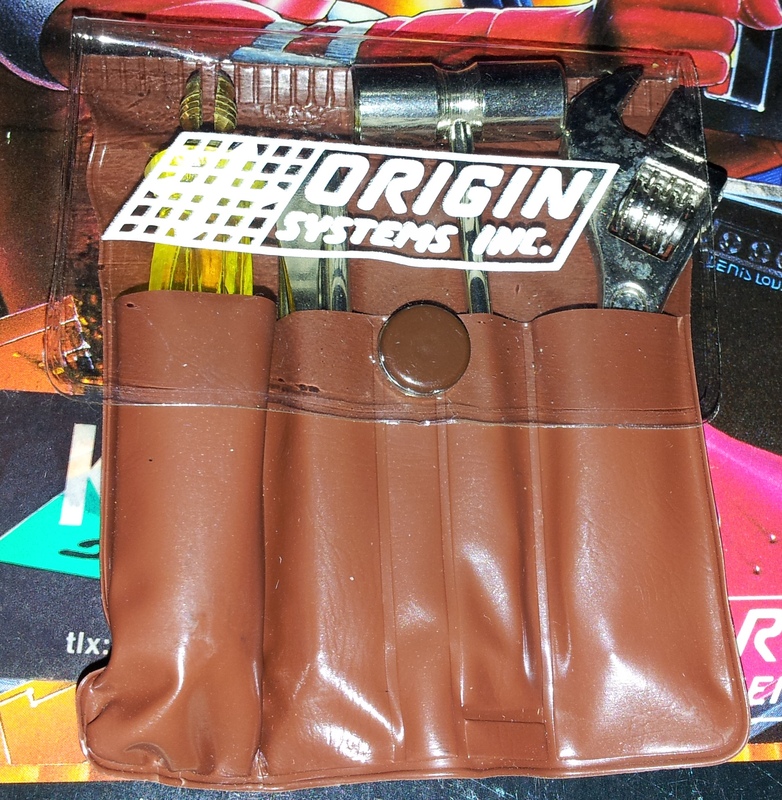 Outside of the Ultima series, Origin stopped including trinkets after these early titles which is something of a shame but they kept their standards of documentation and packaging up which is what I really miss when buying a modern game. It’s hard to make a good case for why these sorts of trinkets should ever have been included but they are one of the things that make collecting old games so much fun. This version which I’m assuming to be the oldest of the three has large box covers for each game. It may not show in the scan but these have been cut out and stuck over the top of the sheet. 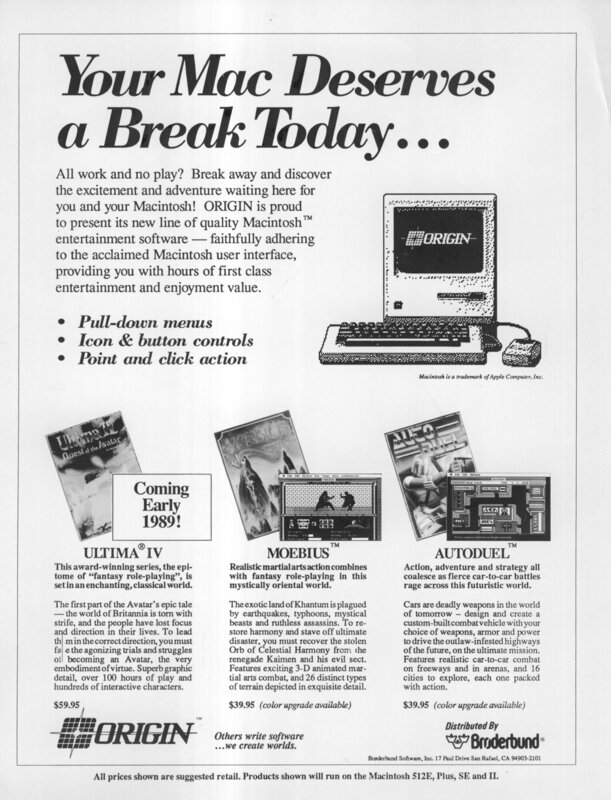 I still find it hard to imagine anyone doing desktop publishing like this but the computer equivalent only came into being around the mid 80’s. I can only speculate what happened after this stage of the process and if anyone actually knows how it would have worked I’d love to know. I’d expect that the Ultima 1 logo that Paul Barnett was showing off on Ultima Aiera a few days back must have been done in the same way when adding the I. It’s clearly the logo off the 1986 remake box anyway so his explanation of a sudden realisation of possible sequels doesn’t fit. I can easily imagine the decision to add the I to the remake cover being made late on or there may even be an alternative design underneath. Even if it’s not the original 1980 Ultima logo as such, I’d still love to have it hanging it on my wall. This second version of the advert has a different design incorporating screenshots. All the boxes and screenshots have been stuck on afterwards once again with the same screenshot being used for all 3 games. I’m assuming that this is a test run for the final version as it’s a glossy print with no later additions and it has the correct screenshots. I’d need to find it in an actual magazine to know for sure. This isn’t a perfect print with a glitch in the text for Ultima 4 and a few darker splodges visible within the larger letters. For all those versions, it’s not the most aesthetic or interesting of Origin adverts but I would quite like to try these games out with the added mouse interface. Judging by other games of the era, I don’t expect it would have added anything when introduced as an afterthought but I could be wrong. I’m really curious as to how the combat in Moebius and Autoduel would have worked with a mouse. I finished off Moebius today. The first task was to track down the condor and get some feathers. The game has a listen command you can use to track down anything on the map – it gives you a sound e.g. flapping of wings and a direction. I found the condor in the south east of the map and at dusk it nested so I swung my sword at it and took a few feathers. This meant I could now transform into a condor and fly to the previously inaccessable level exit teleport. I couldn’t get this to work for a while, but a quick read of the manual reveals that I have to get the were-spell blessed by a priest first. The final world is the world of fire. Thankfully this world is a lot shorter than the others, but the battles are also a lot tougher, with nothing except evil monks to fight + the warlord. This is the fight with the final warlord. He kills you with one hit, but is far easier to hit than the monks so this is actually a much easier fight. The warlord was guarding the orb but if I try to pick it up I get sick. It appears I will have to rescue the two priests first. I have to lead them back one at a time from the far side of the map as the second one drowns otherwise, but I get both shrines liberated and one of them gives me some gauntlets. Once I have the gauntlets, I use them to pick up the orb and head for the exit teleport. I go through that and I’ve won the game. The ending is very brief. Moebius himself says a few words and thats it. 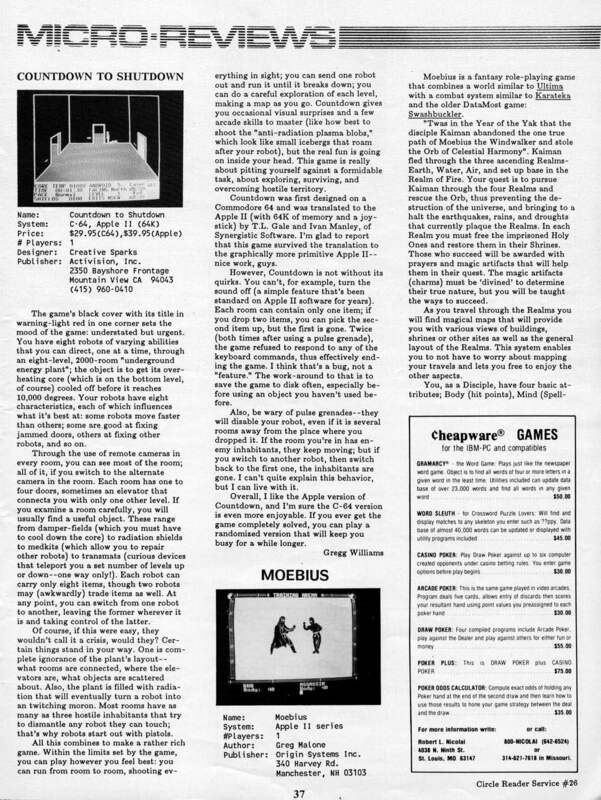 He does say to write in and inform him of your accomplishment – this implies that Moebius may have had completion certificates like the Ultima games. I’m glad to have got this game out of the way. I didn’t especially enjoy playing it, and without the level maps I found on the web it would have been worse. Back in 1985, the graphics and novelty would have been enough I expect to forgive the other problems. Playing it now, I’m really just looking at the gameplay which was slow, boring and repetitive. I couldn’t even use the option of speeding the emulator up as I ended up passing turns through not moving quickly enough and running out of water. I’ll have the sequel Windwalker to play at some point, I really hope its more fun than this. This game came out in 1985 for Apple 2 and was created by Greg Malone. It’s an unusual blend of RPG and martial arts which used motion capture for the fighting sections. Very briefly, the back story goes that Moebius aka The Windwalker, went into the four planes of existence and trapped the four element spirits inside a shard of crystal to create the orb of celestial harmony. He had to invest so much of himself to do this that he can now only exist inside the realm of air, hence the name windwalker. One of his disciples has stolen the orb, and taken it to the realm of fire. The land and weather are corrupted, you must travel to the realm of fire and defeat him. On starting up their is a brief graphical introduction to set the scene, told by Moebius himself. Once this is over I create my character. Before the game lets you start you have to train in three disciplines. The first of these is unarmed combat. The controls take a little getting used to. You have two left and two right keys, one of which moves you quicker than the other. There are also three punch, and three kick keys to aim at the head, middle or legs of your opponent. You can block with space. Low blows seem to hit way more often against everyone except evil priests who need kicking in the head. This is the armed combat training. The same strategies seem to work here also. This is the third discipline – divination. This just consists of stopping the little ying/yang from moving out of the box. This is used in the game to get spells after you return priests to shrines. The controls are odd again – the game doesn’t use the standard cursors but instead uses the eight keys around L. I’ve played a good 3-4 hours of this today and still can’t get used to it. This is what it looks like when you start the game proper. I’d say there’s a bit more detail than in the U3 graphics. All the characters are represented by their top halves, which looks very odd. However, it does mean you know what you are fighting. The little ultima stick monsters, all look pretty similar so it gets around that. The tiles also overlap a bit, i.e. a tree on one tile can stop you seeing the one behind it. This gives a mini 3D effect but given the amount of time you spend hacking through shrubbery in this game it would be nice to be able to see what was there. Often I end up trying to hack through a rock and blunting my sword because I can’t see it. All combat takes place on screens exactly like the training ones shown above. At the start of the game, I’m hitting for 1 damage every time and winning fights is hard work. When I do level up, Moebius appears and I get a little haiku about an animal as above. There are 6 of these for each realm. I immediately started to do more damage as soon as I leveled up and the game became a lot easier. Because of the arcade nature of the fighting though, stats are less important than a conventional RPG, however bad they are you can always win if you can play the arcade section well enough. You have to play through each of the four realms (earth, water, air, fire) one at a time. In each realm you must kill the overlord, rescue 2 priests and take these two priests to two shrines to cleanse them. Once thats all done there is a teleport to take you to the next realm. There are only 2 monsters you will commonly face, assassins and palace guards. There isn’t much difference fighting either. The temples are guarded by evil monks – if you attempt to fight one of these with your swords they melt it so you always have to fight them with your hands. These are much harder to kill than other enemies. Running out of food and water are the biggest threat in the first couple of worlds. You can get water from cisterns dotted around sparsely on the maps. Food can only be gained by killing people. By the time I get to the 3rd world, the novelty of this game is wearing thin. All the fights can be won using the same strategy and are very easy once a monk has blessed your sword. Despite this its still very slow going, you can’t just walk anywhere, you have to chop trees down to get through and the fights keep coming constantly. So far there’s no plot and nothing new. The second zone was just more of the same. The air world has at least added some new elements. There is a demon that shows up at night, which just before dawn turns into the minstrel. If he catches you at night you get seriously hurt and your karma goes right down (which stops priests following you). From hints in the game and the manual, I have to catch him as the minstrel while wearing the amulet. There are observatories on each level which give you a map of the area – I find the amulet at one of them. This is the minstrel who gives me an artifact, which after divination turns out to be a were-spell. I will need this to get to the exit teleport assuming I can find some condor feathers tommorow. After a few hours on this game today, I’m not massively impressed. The graphics are definitely good for its day and the fighting element is a completely original idea. There are the elements of a decent game in there but it is just too repetitive and too slow. This game is at least as big as Ultima 3 was but there just isn’t enough there to keep it interesting. I’ll stick with it anyway and look forward to Ultima 4 when I get it finished.